Autograph album presented to Mrs. Sarah Alexander (Colby) Crabtree by her sister-in-law Elvira J. (Cushman) Colby. Some of the inscribers, if not Sarah herself, had gone to California, as indicated in their inscriptions, but I believe most, if not all, returned to Maine at some point. The album measures a bit more than 4" by 2-3/4" and contains the sentiments of 15 of Sarah's relatives and friends. An alphabetical list of the inscribers, together with any personal information they offered, appears at the end of this post. Elvira J. 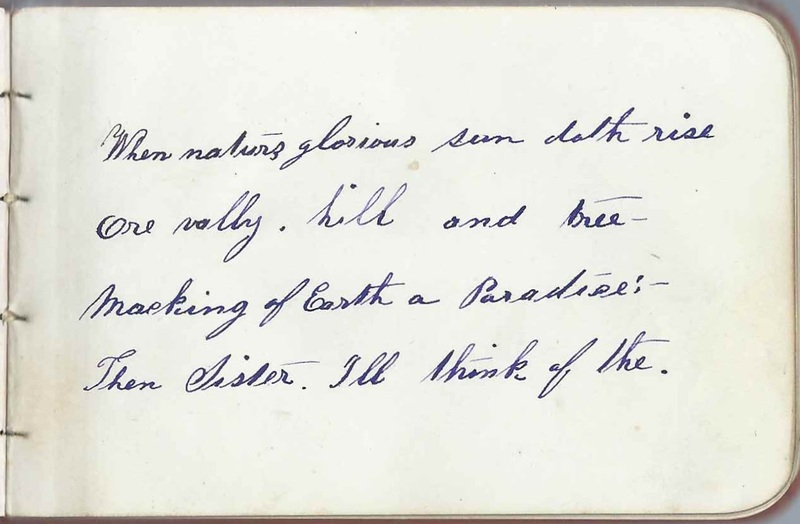 (Cushman) Colby inscribed another page in the album, and her husband Edmond Harvey Colby, who was Sarah's brother, inscribed a 3-page sentiment. At the time they were living at Columbia, California, but I don't know if Sarah visited them there or they inscribed their pages while back in Maine. Sarah Alexander Colby was born January 27, 1813 at Ellsworth, Maine, daughter of Eli K. Colby and Sarah Hardison (Jordan) Colby. 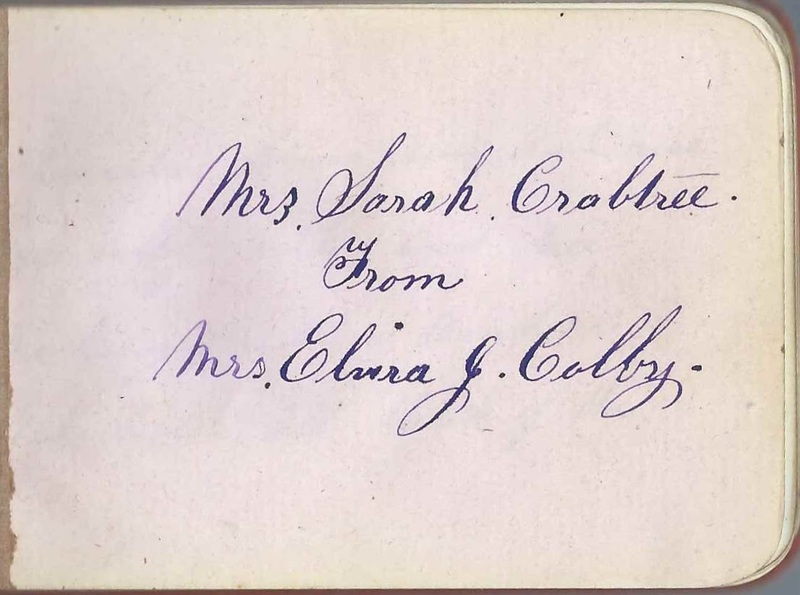 Another of Sarah's siblings inscribed a page in the album. 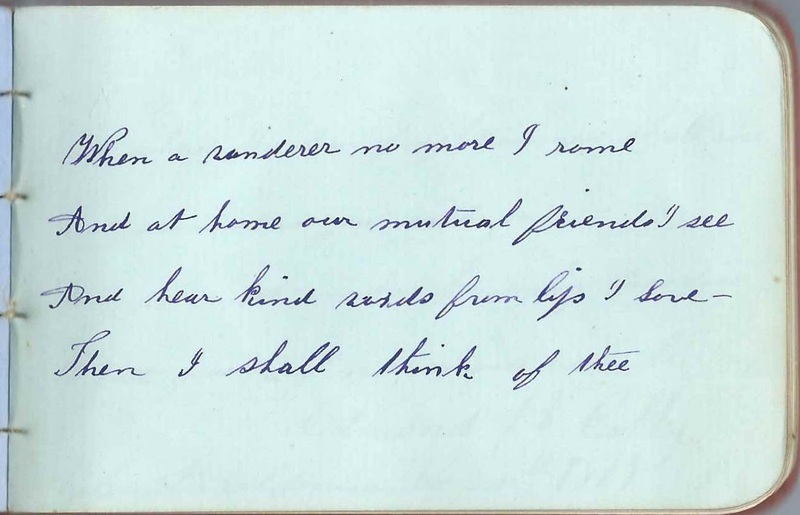 She was Charlotte Christiana (Colby) Kingman, whose husband Joseph Morrison Kingman inscribed the left facing page. Arvilla S. Kingman of Waltham, Maine; inscribed on July 8, 1880. Daughter of Joseph Morrison Kingman and Charlotte Christiana (Colby) Kingman, who was a sister to album owner Sarah Alexander (Colby) Crabtree. Mr. H. B. Kingman of Newport, Rhode Island; inscribed at South Hancock, Maine, on August 13, 1881. Presumably Hudson Barzilla Kingman, son of Joseph Morrison Kingman and Charlotte Christiana (Colby) Kingman, a sister to album owner Sarah Alexander (Colby) Crabtree. 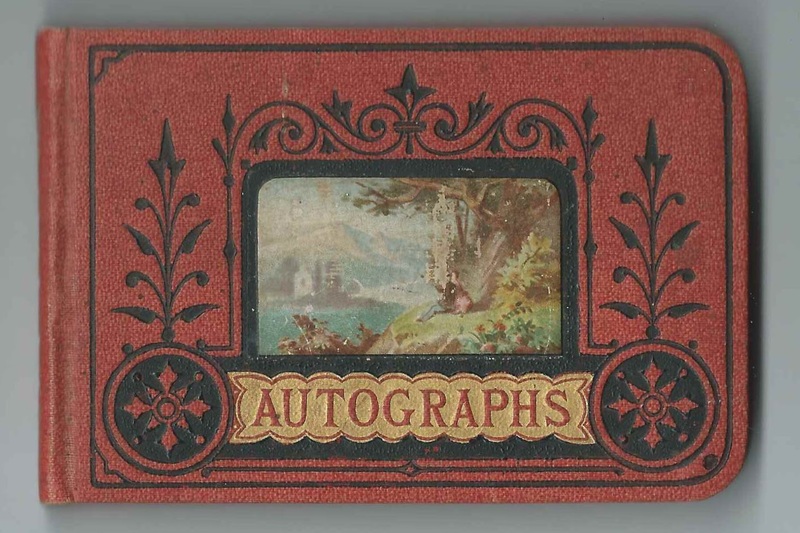 His wife Julia Evelyn (Tracy) Kingman inscribed the right facing page. Mrs. J. Evelyn Kingman of Providence Rhode Island; inscribed at South Hancock, Maine, on August 13, 1881. She was Julia Evelyn (Tracy) Kingman, wife of Hudson Barzilla Kingman, who inscribed the left facing page. W. H. Kingman of Chelsea, Massachusetts; inscribed on June 8, 1881. Possibly William Herbert Kingman, son of Joseph Morrison Kingman and Charlotte Christiana (Colby) Kingman, who was Sarah's sister. On January 2, 1838, Sarah Alexander Colby married Asa Crabtree, son of George and Rebecca (Hopkins) Crabtree. Asa died in 1893 and Sarah in 1899. They're buried in the Riverside Cemetery at Hancock, Maine. Elvira J. (Cushman) Colby, wife of Edmund Harvey Colby, who was a brother to album owner Sarah Alexander (Colby) Crabtree, wife of Asa Crabtree. Elvira's name is on the presentation page, and she also inscribed an individual page on December 28, 1879, either at Columbia, California, or while on a visit back to Maine. 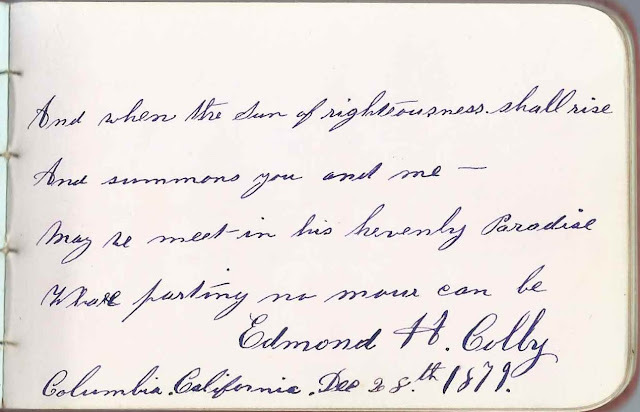 Edmond H. Colby; inscribed a 3-page sentiment at Columbia, California, on December 28, 1879 or when visiting back home in Hancock County, Maine. Album owner Sarah's brother. Sarah Alexander (Colby) Crabtree of Hancock County, Maine; album owner and wife of Asa Crabtree. Sarah was given the album by her sister-in-law Elvira J. 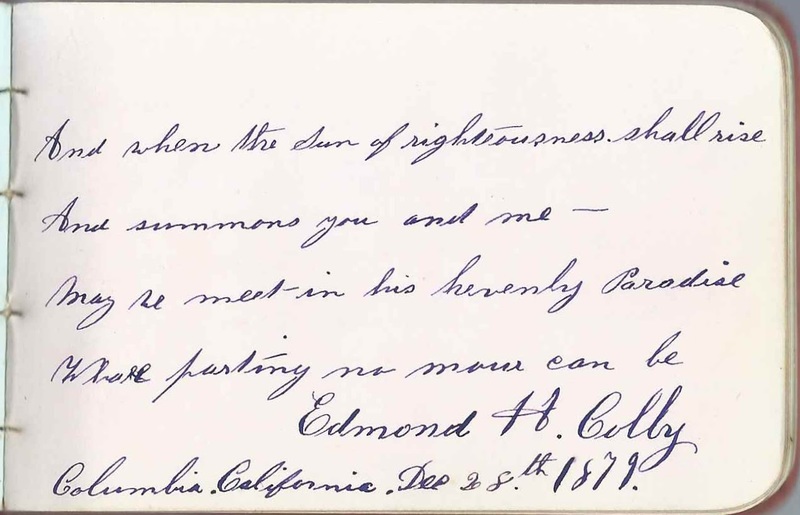 (Cushman) Colby, wife of Sarah's brother Edmond Harvey Colby. Joseph M. Kingman; inscribed at Waltham, Maine, on July 7, 1880. 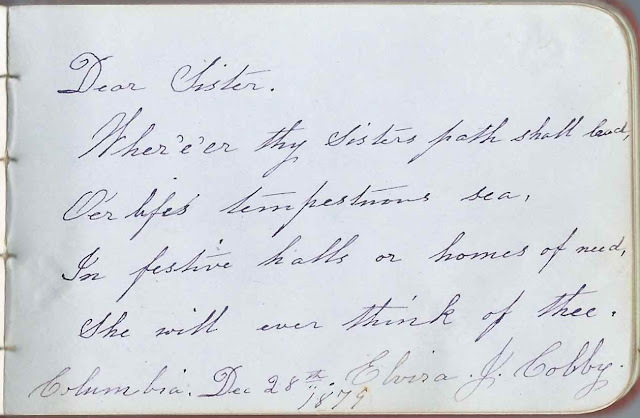 His wife Charlotte Christiana (Colby) Kingman, a sister to album owner Sarah, inscribed the right facing page. Charlotte C. Kingman; inscribed at Waltham, Maine, on July 7, 1880. She was Charlotte Christiana Colby, a sister to album owner Sarah. Charlotte's husband Joseph M. Kingman inscribed the left facing page.